Sitting On The Sound is a great place to just sit back and relax. The new home has all the upgrades. Sitting On The Sound is a great place to just sit back and relax. This new home has all the upgrades. King Size Bed, Sleeper sofa, Wi fi, Cable TV. It's the perfect location to watch the sun rise and set! Just minutes to Downtown Carrabelle, City Boat Ramp, 5 minutes to Carrabelle Beach. Places to visit in the surrounding area include: Tate's Hell Nature Trail, the Historic Carrabelle Lighthouse and Museum, Camp Gordon Johnston World War II Museum, Dog Island Ferry excursions, charter fishing, kayaking, cycling paths across the road, glass-bottom boat rides at Wakulla Springs, Panacea's Gulf Specimen Marine Lab (with touch pools for children), Apalachicola National Estuarine Research Reserve, a variety of local seafood eateries and a local supermarket.Close by is the beautiful St. James Bay Golf Course and Resort 370 Acres of Golf Community, Resort Style 18 hole Play golf course designed by Robert Walker. The Famous Crooked River Grill is just 15 minutes away. 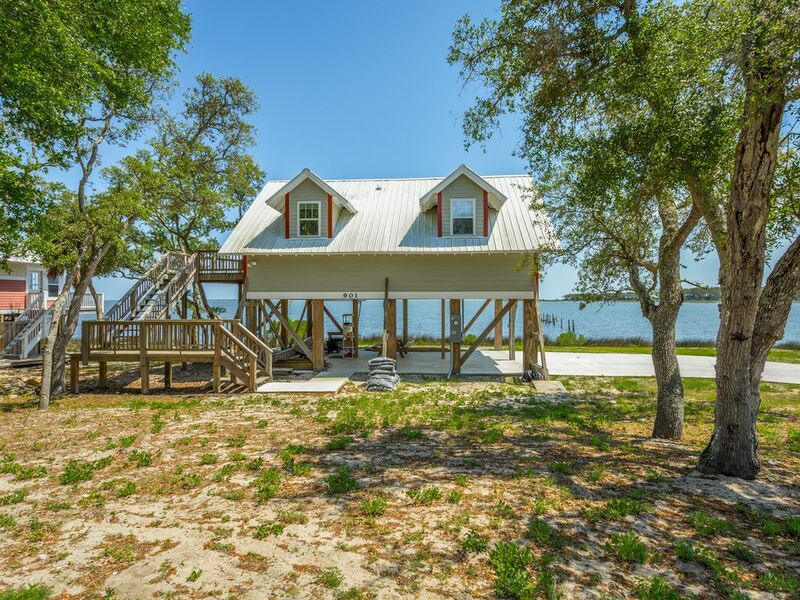 Located a little over an hour's drive from Tallahassee, and only twenty minutes from St. George Island and Apalachicola, this retreat can be tailored to your own adventurous spirit. Come and discover the true meaning of "The Forgotten Coast". First, the cons: apparently a new driveway was required, so the old one was broken up in very large pieces and piled behind the house. Work is underway to break this up into smaller pieces to place around the house's foundation; it should be quite attractive when complete; now, not so much. An opportunity was missed to make egress from the house easy by omitting a pad to back onto for turning around when putting in the new driveway. Ladders left under the house cluttered the parking spaces making one unusable and the other tight. The wifi connection is unreliable and insufficient to stream video. Pros: wonderful view of the sound promotes a tranquil mood; the area of the sound near the house would be ideal for kayaking. The area is quiet, with little traffic to disturb the peace. Numerous, nearby, non-busy streets afford great opportunities for extended bike riding. We were excited to discover a Keurig coffee maker, not having noticed it listed in the amenities. Lots of shelves in the bathroom to lay out toiletries and bathroom paraphernalia. Essentially a quaint, quiet hideaway. I'm giving 4 stars. The place was nice given the fact it survived the last hurricane. There was a bit of trash and debris left over from the hurricane that has just been left underneath the house, which made hard to park a vehicle or boat without tripping over something. The driveway was nicely done, but again the old concrete has just been pushed down to the water and has just been left there. Inside the home was nice and simple which turned out great minus a couple missing pieces... I didn't think about not having a washer and dryer just for the fact most everyone has one. This house however does not, nor does it have a dishwasher like it stated on the post. I found that strange because there's a spot for a washer and dryer, which has been turned into a closet for the vacuum and some other random inventory for the home. I wish something was said about this before, I stayed for the month and would have liked to had a washer and dryer rather than going to the local laundromat to wash clothes. There's also a big industrial size exit sign at the only door leading out of the house(small house). Again, I'm not sure why you need this, but there is no way to turn it off, so at night the whole house glows red. I've never rented a house from VRBO that had this so just another weird thing I guess. Again, the house worked out good and I would recommend this to someone else, only if they just wanted something for a weekend or just a week. Great views, close to parks and you can walk just about anywhere. I'm glad it survived the hurricane and I'm sure that's a hard thing to recover from, so hopefully I can come back to see it all cleaned up. The view was absolutely gorgeous. The outside looked great and we loved the privacy of the home and the property around it. However, there were a few “cleanliness” issues on the inside of the home. Since there is no dishwasher, it looked like the glasses and dishes were cleaned very poorly by hand. Lots of spots and pieces of food still on them. Also, both the towels and sheets had stains on them. While I do think they had been washed, they still had plenty of noticeable stains on them. Another issue was the amount of sunlight that came though the window so early in the morning due to the blinds being broken in the bedroom. I would suggest fixing those. I would also suggest putting a window unit in the bedroom. Overall we enjoyed the stay. Again, beautiful view and cute house. Perfect for one couple looking to get away and the price was awesome. But there were just a few things we felt could have easily been fixed that weren’t. I am so sorry you had the problems that you did. We strive hard to accommodate our guests to make sure they enjoy their stay. Those problems have been corrected as of now. If at anytime you check into one of Sandy Beach Properties and are not satisfied please call the office immediately so when can fix any problems that you might see or feel needs attention. Again, I apologize for these mistakes. This is such a cute house with an absolute beautiful view!! A little dusty on the inside, I couldn't stop sneezing so I cleaned a little and it was all good!! Definitely worth the 8 hour drive from SC. WE LOVED IT!! The town is so small, everyone knows everybody and they were all very friendly! Carrabelle and this great one bedroom property offered all we needed for some much needed rest and relaxation from the hustle and bustle of our daily lives. Along with enjoying all the shopping along the coast, we sipped coffee, and counted the stars as we watched the sun come up. Everyone we met was so friendly and welcoming. We've definitely found a hidden treasure with this property. The only thing I would suggest is bringing a box fan to pull the cooler air from the living room into the bedroom during the warmer summer months. We can't wait to return! This is a beautiful place to come and relax and enjoy that weekend getaway or vacation stay. You will love the peace and quite, and the sunrises and sunsets. Call and book your reservation today! !